I would love to know what you think of this newsletter! Simply hit the reply button for your questions and comments about this newsletter. January is a time of change and new goals. Maybe your goal for your dog this year is to go for regular walks and shed a few pounds. 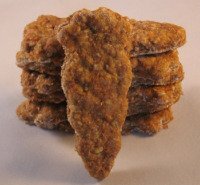 Well, whether your dog needs to lose weight or not, she'll love these tasty low fat dog treats. There's one to match every taste bud. Fruity & Sweet Carrot Treats Try this low fat sweet treat. It has carrots, banana, and applesauce to satisfy your dogs desire for sweets. Salad in a Dog Biscuit We've crammed 4 veggies and one fruit into this delicious dog biscuit. Just try and keep your dog away from the delectable spinach, broccoli, cauliflower, carrots, and applesauce. 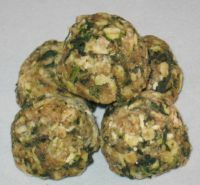 Italian Spinach Balls These savory treats are loaded with vitamins. But your dog will notice the delicious hint of nutty Parmesan cheese and aromatic oregano. Your dogs road to weight loss may seem like an unpleasant one. But it doesn't need to be. With a few tips and techniques, you'll both be surprised at how much fun it is to drop a few unwanted pounds. Read our tips on how to help fat dogs lose weight and gain vitality and years to their life. After consulting with your Veterinarian, you may want to look for low fat dog treats, reduced calorie dog food, and even vitamins and minerals that can help your dog lose weight. "I found a great recipe for dog treats in your site which is suitable for a pooch with Addison's disease. He tolerates them with no effects - HOORAY!!! Thank you." "My little Ginger knows what she likes and "does not eat everything", but your pumpkin pie dog biscuits were a HUGE favorite for her. She loved them and went absolutely wild over them. I need to make her some more liver treats because she loved those as well. My little Ginger is a great test kitchen dog, she has approved with great enthusiasm many of your recipes, keep up the good work." While most peoples thoughts turn to romance and love in February, we're going to take a slightly different approach.